Special thanks to Kris Vetter Tomes for the following post! 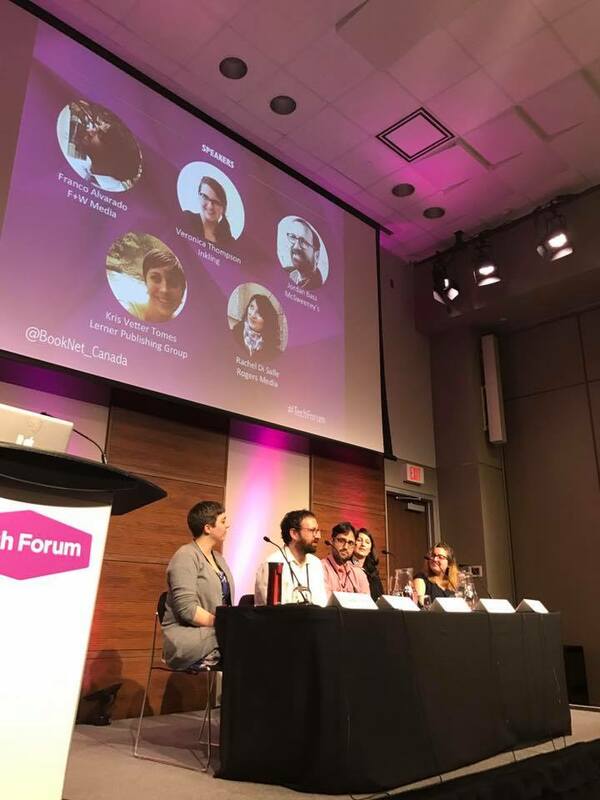 I recently attended ebookcraft and Tech Forum, a joint, 3-day conference in Toronto hosted by BookNet Canada that explores various aspects of digital publishing. In addition to some delicious poutine, I saw some very interesting talks and workshops, and moderated a panel about repurposing content. Rachel Di Salle (Rogers Media), Franco Alvarado (Brill), Veronica Thompson (Inkling). The main themes in this 3-day conference were the importance of accessibility (a11y), listening to your readers, pros and cons of DRM, the uncertainty of the future of “eBooks” (Will it be browser-based eBooks? Will it be something else? ), and the increase in automation in eBook creation. The Toronto Public Library had over 5 million eBooks downloaded in 2016 alone, and saw a huge increase in demand for audiobooks, as well as an increase in requests for, read-along eBooks (like Lerner’s award-winning Audisee product), comics and graphic novel eBooks, children’s picture eBooks, and e-cookbooks. TPL has seen an increase in devices used to read eBooks, which includes anything from e-readers to mp3 players to tablets to phones. Readers are shifting away from PDFs and towards other eBook format types with more functionality and accessibility options—so much so that TPL now avoids purchasing PDFs. All three of the panelists stressed the importance of metadata, correct BISAC headings, and the need for more accessible eBooks. 84% of Americans and 82% of Canadians read a book. 38% of people said their reading/listening habits have increased. 26% of people read/listened to audiobooks in 2016—a HUGE increase from previous years. Audiobooks are especially popular with females aged 25-34. 90% of people read print books and 48% of people read eBooks, which are both similar to the previous few years. The print book market is down 3.7%, which is within the margin of error. Noah attributed this to the spike of adult coloring books in 2015, and their subsequent fall in 2016. Reading eBooks on a smart phone is up by 20%, and reading on an e-ink device has dropped off significantly. I highly recommend this annual joint conference for anyone interested in digital publishing. ebookcraft is more geared toward those who personally produce eBooks or distribute them, whereas Tech Forum is broader and aimed at anyone in the publishing industry—book creators, book sellers, book marketers, book buyers.